I’ve always enjoyed this entry, and it’s another episode well remembered for the main premise. How’d you like to get on an amusement park space ride and then be handed the real deal? That’s what happens to a group which accepts free tickets from a bird-like alien for the Joyland Space Ride. Don Gordon (THE INVISIBLES) returns as Dave Crowell, the pretend captain of the ride. Simon Oakland is this week’s bear, a creature known as the Empyrian. Their performances are the highlight of the story, and the supporting cast is fine as well. Some tense moments as the abductees realize the harsh reality of their situation, and the tale progresses with some interesting ideas. The makeup on Oakland is very good, with thoughtful facial and hand touches, and locks of hair flowing realistically with the wind. I also think the space craft itself holds up well today – with nice shots of it hurtling into the cosmos. The music, camera work, dialogue and pacing also help lift the show. Simon Oakland is great as the Empyrian. I read once that when he was approached about being in the episode, he agreed, but only if he could portray the alien. A cool OL which again reminds me of my youth, monster mags, bubble gum cards, and wild network TV shows. “There’s only one solution to our problem..."
wow- a new one! yay! i'll watch this tomorrow, and report back. Again I turn to the Outer Limits BOOK written by David Schow. The facial make-up of the Empyrian alien was later used again on STAR TREK in the pilot episode "The Cage." The only difference is that in "The Cage," the alien had a ludicrous-looking beak. Ironically, that was how the alien was supposed to have looked like originally in SECOND CHANCE. Fortunately, due to Mr. Stefano's good taste, the Beak was omitted. 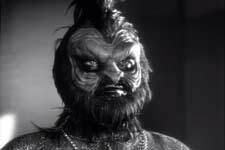 But if you want to see how ridiculous the beak appears, then check out the Star Trek episode. He's one of the aliens held captive by the Talosians. I seem to recall reading that too somewhere. I have the first season of STAR TREK on DVD. It has the 2 part re-imagining of the pilot as THE MENAGERIE so I'll have to give it a look. I forget if the inprisoned creatures are shown in that version, but I also have the original THE CAGE on VHS some place. 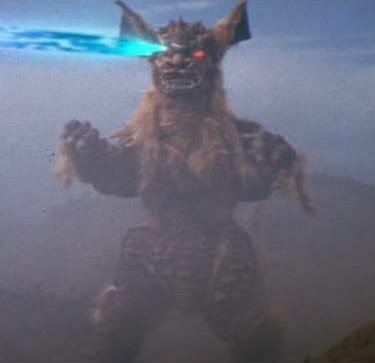 Also, when Captain Pike is strangling one of the Talosians, it briefly morphs into a creature which looks like the ones from another OL episode - FUN AND GAMES. Do you know if that was the same or similar mask, Preston? Yes, Lunk, you're definitely correct. In the scene where Pike strangles a Talosian, it briefly morphs into a creature whose prosthetic-make-up was definitely borrowed from the OL episode FUN AND GAMES. That's because make-up artist WAH CHANG worked for both OUTER LIMITS and STAR TREK. So,yes, you're right. Still about SECOND CHANCE, the Empyrian was originally meant to have a beak because the background is that the Empyrians had EVOLVED from birds. This rings a bell for me because it vaguely reminds me of a comic book story I had bought during the 1960s where astronauts land on another planet and encounter aggressive Female warriors,which I guess you could call Amazons. They look perfectly HUMANOID and carry spears and wear battle-helmets. They look normal as far as human-looking but when they remove their HELMETS, their heads are seen to have FEATHERS growing. It is explained that they were originally a bird-race which had evolved into humanoid. The sparse growth of the few remaining feathers on their heads are what are called VESTIGIALS, that is, a remainder of a body-part that still remains even though it has become obsolete. I'm trying to think of an example from an animal in real life, but I can not recall at the moment, but some examples can be found in real life, which is how we derive the word VESTIGIAL. In the case of those Amazon Women, that idea came as a surprise because of the scene where they remove their helmets. In a similar vein, for SECOND CHANCE, the evolutionary process eliminated the Empyrian's beak but Not his feathers, i.e., his Vestigials. Thanks for confirming that, Preston, and for all the other good info. I love talking this stuff! While we're at it about "borrowing," I might as well add that OL's microbial-blob from the episode THE PROBE was later borrowed by Star Trek for the silicon alien the HORTA from the episode DEVIL IN THE DARK. By the way, speaking of STAR TREK, Lunk, did you catch William Shatner on George Nory's RADIO show. Nory asked Shatner what Shatner's favorite episodes are, and Shatner said CITY ACROSS THE RIVER. So Nory had to correct him and say "Don't you mean CITY ON THE EDGE OF FOREVER"? Beats me where Shatner got the title CITY ACROSS THE RIVER. I don't care too much for CITY because the ending was too heart-wrenching for me, but the other one they mentioned, THE DEVIL IN THE DARK, is one of my top five favorites. I used to hear rumors about Shatner and Nimoy having a feud but that was all dispelled by the fact that they are very close friends. In fact, on the RADIO show, Shatner said that when his wife had died tragically, it was Nimoy who helped him through that difficult period. Hey, I didn't know about that one. Thanks! Sure makes sense though thinking about those episodes. NIce to know they are close. I had a feeling they got along well - I love those commercials they did for Priceline where Nimoy's edging Shatner out - all in good fun though, and it seemed like they were having a good time doing them. The very first time I saw SECOND CHANCE during the early 1960s, I did Not know that the Empyrian was portrayed by Simon Oakland. For that matter, I did Not even know of any Simon Oakland. The first time I became familiar with Oakland was the arrival of the TV series NIGHT STALKER where Oakland played Kolchak's boss, Vincenzo. And then it was after that, that I found out that Oakland portrayed the Empyrian. That really shocked me because I was so used to his characterization of Vincenzo as a hot-tempered, easily irritable character whose apoplectic fits threatened to make the blood-veins in his neck burst at any moment. Compare that apoplectic characterization with the calm and dignified demeanor of the Empyrian, and I had to shake my head in astonishment. Nowadays, when I watch SECOND CHANCE repeatedly, even though I now recognize Oakland's voice as the Empyrian, but the facial make-up obscures his face so much that I can forget for the moment that it's Oakland. Add to that the fact that his diction, the way he ENUNCIATES his words as the Empyrian, really convinces me that it definitely is a very DIGNIFIED alien from the stars. I agree. He's excellent in the role and was a superb actor. I always enjoy his scene toward the end of PSYCHO (1960) as he's explaining Norman's behavior. Great stuff. Lunkenstein wrote: I agree. He's excellent in the role and was a superb actor. I always enjoy his scene toward the end of PSYCHO (1960) as he's explaining Norman's behavior. Great stuff. Are you sure that was Simon Oakland in PSYCHO? I always thought it was MARTIN BALSAM. I distinctly remember it was Balsam getting shoved down the stairway. Of course, since I haven't seen a rerun since the 1980s,I could be wrong. If I'm wrong, can you tell me what scene that Oakland appeared in? What sort of character did he portray? Like I said... the mother... Now to understand it the way I understood it, hearing it from the mother... that is, from the mother half of Norman's mind... you have to go back ten years, to the time when Norman murdered his mother and her lover. Now he was already dangerously disturbed, had been ever since his father died. His mother was a clinging, demanding woman, and for years the two of them lived as if there was no one else in the world. Then she met a man... and it seemed to Norman that she 'threw him over' for this man. Now that pushed him over the line and he killed 'em both. Matricide is probably the most unbearable crime of all... most unbearable to the son who commits it. So he had to erase the crime, at least in his own mind. He stole her corpse. A weighted coffin was buried. He hid the body in the fruit cellar. Even treated it to keep it as well as it would keep. And that still wasn't enough. She was there! But she was a corpse. So he began to think and speak for her, give her half his time, so to speak. At times he could be both personalities, carry on conversations. At other times, the mother half took over completely. Now he was never all Norman, but he was often only mother. And because he was so pathologically jealous of her, he assumed that she was jealous of him. Therefore, if he felt a strong attraction to any other woman, the mother side of him would go wild. Thanks for the info, Lunk. As can be seen from Simon Oakland's dialogue that you quoted, the reason I find the movie difficult to stomach is its idea of MATRICIDE. That crime is the most abhorrent, the most evil of all, which is why I simply can NOT stomach it. To tell you the truth, Hitchcock did much, much better on Television. In fact, in many of the TV-episodes, there were even NO murders at all. I think I'll review my favorite episodes in a later post. As far as the character of Norman and Insane-type characters in general, the best one I found was the movie SYBIL, which was based on a TRUE story of a woman with MULTIPLE PERSONALITES. SYBIL should belong in my Other thread of TRUTH IS STRANGER THAN FICTION in that Sybil had over twenty different personalities. The way they were proven to be genuine was because one of them had a skin rash which appeared and disappeared. That is, when Sybil inadvertently switched from one personality to the other personality, then the rash would suddenly appear. And Sybil had many other amazing anomalies which manifested from her disorder. So as far as movies about Insane-type people, SYBIL has to be the best. NO murders in it, and a True story at that.